Do you work hard all year to make your Jewish community more exciting, inclusive and better? Do you need some time to (re)inspire yourself, learn more and be part of a fantastic European network? 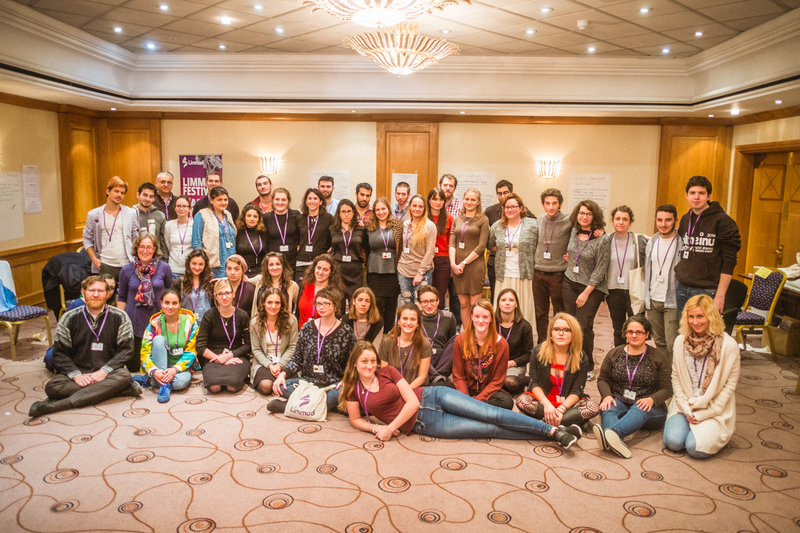 Join the Yesod delegation of European Jewish community professionals and activists at Limmud UK and (re)connect to the inspiration, Jewish learning and networks that can support you! Limmud Festival is the biggest and most exciting Jewish learning festival in the world! With over 3,000 participants and the opportunity to learn from over 1,000 diverse sessions on every Jewish-related topic under the sun, you will gain inspiration, knowledge and connections to take back to your community. You will also meet Jewish professionals and activists from around the globe, and explore everything from politics to performance, new approaches to Jewish texts, daily Chavruta learning, history, social action, community development and more. There is something for everyone! Yesod is delighted to bring a delegation of Jewish community professionals and activists to Limmud Festival each year. Yesod @Limmud offers the chance to experience everything Limmud has to offer, plus up to 2 dedicated sessions each day designed just for European Jewish community professionals and activists. Get to know your European peers, as well as being part of the Festival as a whole. We also offer a Shabbat programme so you can settle in before the main Festival begins, and enjoy the power of Limmud Shabbat. In 2018 Yesod @Limmud will be offering two tracks: one for full-time Jewish community professionals and one for community activists and volunteers. Limmud Shabbat and some sessions will be for both tracks. Choose the appropriate track for you when you apply. When is Yesod @Limmud taking place? You may also join for the optional Limmud Shabbat taking place Friday 21– Shabbat 22 December 2018, for which Yesod will cover the cost. You may not join only for Limmud Shabbat. Where is Limmud Festival? : Pendigo Lake, Marston Green, Birmingham, West Midlands B40 (Close to Birmingham International Airport). What does sponsorship at Yesod @Limmud include? Yesod will fund participation for up to 40 people at Limmud Festival 2018 UK. Each place, valued at over GBP £500, includes accommodation (shared twin rooms in the Hilton hotel where the main programming will be), meals and access to the Festival programme from either 21 or 23-27 December 2018. Organised Limmud transport is also included if you choose to use it from London to the conference. Participants may upgrade to a single room at their own expense, subject to availability, with direct payment made to Limmud. Who can apply for Yesod @Limmud? Jewish community professionals, educators and activists working and living in Europe, for whom being at Limmud will be beneficial in their community work. We expect many more applicants for Yesod @Limmud than we have space for so the application process is expected to be competitive. Priority will be given to those who have not been to Limmud Festival before, did not receive Yesod sponsorship to Limmud Festival in 2016 or 2017, and are not currently taking part in a Yesod programme. A high level of English is required as all sessions will be delivered in English. We will ask you to tell us how you intend to use the Limmud experience in your work, and we may ask to meet you for a short interview (online). Are based in one of the following European countries: Albania, Andorra, Austria, Belgium, Bosnia and Herzegovina, Bulgaria, Croatia, Cyprus, Czech Republic, Denmark, Estonia, Finland, France, Germany, Greece, Hungary, Iceland, Ireland, Italy, Kosovo, Latvia, Liechtenstein, Lithuania, Luxembourg, Macedonia, Malta, Monaco, Montenegro, Netherlands, Norway, Poland, Portugal, Romania, Serbia, Slovakia, Slovenia, Spain, Sweden, Switzerland, Turkey. Please note that this specific Yesod initiative is not open to those resident in the UK. Please note that applicants intending to take part in Limmud Festival as European Limmud volunteers will only be eligible to receive sponsorship from either Yesod or Limmud, not both. What do participants have to do? Have an amazing time and take full advantage of everything Limmud Festival has to offer! In addition, Yesod @Limmud participants are required to take part in the introduction and closing Yesod @Limmud sessions, and at least one dedicated Yesod session each day. For more information, see programme below. This is the minimum requirement. There will be additional optional Yesod sessions as well as plenty of opportunities to meet European participants. There will also be an opportunity for you to share your knowledge and interests by offering a session to the whole Limmud Festival. What does Yesod @Limmud cost? Yesod will pay the full cost of your participation (accommodation, meals and the programme) in Limmud Festival, including the optional Shabbat, if you wish to join. You will need to pay for your flight, visa costs and local travel costs in your country of origin. You will also need to purchase your own travel and health insurance. However, we want to ensure that financial difficulty does not prevent any successful applicants from participating. If you think that you will struggle to cover these costs, please complete the relevant questions on the application form and Yesod will contact you to discuss a travel subsidy if you are selected to take part. Jewish Text Learning: Engaging and meaningful sessions from the best Limmud teachers, only for Yesod participants. Lessons from Building Community: Learn from Jewish leaders and community-builders from around the world about how they have been successful and the lessons they want to share. Pre-Festival Shabbat programme (optional): Start the (re)inspiration with a meaningful Shabbat, get settled, learn how Limmud Festival works and meet the European participants. In addition to the opening and closing Limmud sessions, Yesod @Limmud participants are required to participate in at least one Yesod session every day. Do you have something you want to share with other Limmud participants? It’s a core Limmud value that “Everyone should be a student and anyone can be a teacher”, and every participant is encouraged to teach – whether your interest is Talmud, Jewish History, Israeli Dance or 17th century Jewish Italian poetry, there will be people at Limmud who’ll share your interest and passion. There are limited slots available for Yesod participants to present, so on the application form for Yesod @Limmud we will ask you if you have a topic you would like to present. If you do, tell us about it and we will contact you to let you know if your topic has been accepted. If you have any questions about this, contact us at info@yesodeurope.eu. We may contact you for a short online interview. Yesod will aim to notify successful applicants by Friday 19 October together with information on how to register for your place at Limmud Festival.